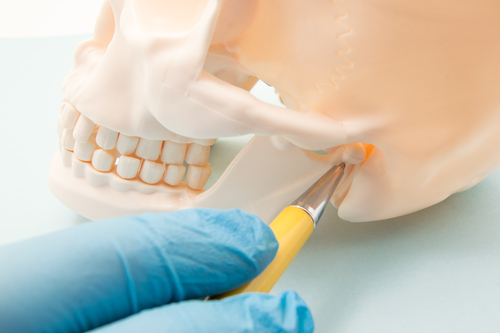 If you suffer from a tight and painful jaw, chronic headaches, or bruxism (grinding your teeth), you may have a temporomandibular joint (TMJ) disorder. If you live in Houston or the surrounding area, count on the team at Memorial Park Dental Spa, including Dr. Nishano Thomas, Dr. Mary Abdou, and Dr. Chaluparambil. They offer customized expert dental care to relieve your discomfort. Call or make an appointment online today. Although TMJ stands for temporomandibular joint, people often use the acronym to refer to temporomandibular joint disorder, a condition that involves painful tightness in the jaw. When you have a TMJ disorder, the muscles and tendons that allow you to chew, talk and smile are tight and distended, which causes inflammation, pain, and reduced movement. If you have arthritis, poor posture, trauma to your jaw, or even high-stress levels, you are at risk for developing TMJ. Dr. Thomas and Dr. Abdou may use X-rays to get a good look at your jaw and check for abnormalities. They’ll listen to your jaw as you open and close your mouth and use their hands to feel the way it moves. They’ll also talk to you about your symptoms, your areas of discomfort, and the pain you’re experiencing. Dr. Thomas and Dr. Abdou can customize treatments for TMJ, depending on the severity of your condition and your specific needs. In many cases, symptoms are mild and resolve after a few days of rest, eating soft foods, alternately applying ice packs and warm compresses to your jaw, and taking anti-inflammatory medications. You might also benefit from wearing a night guard while you sleep. There are a variety of designs available, and all help hold your jaw in the correct position. This not only reduces tension in your jaw, but also prevents bruxism, and in some cases might even reduce snoring. Botox® injections can also help relieve TMJ symptoms. Botox works by temporarily paralyzing and relaxing muscles. If a muscle spasm in your jaw causes your TMJ, the injection can help release the spasm and relieve your symptoms. If you’re concerned about TMJ, call or schedule an appointment online today.